At the end of last month we saw a multitude of graphics cards based upon the Nvidia GeForce GTX 1660 Ti documented by the EEC, the Eurasian Economic Union common trade body. A number of Gigabyte and MSI branded cards were listed at that time. These documentary notifications occur ahead of sale / distribution of imported electronics in EEC countries such as Belarus, Kazakhstan and Russia. 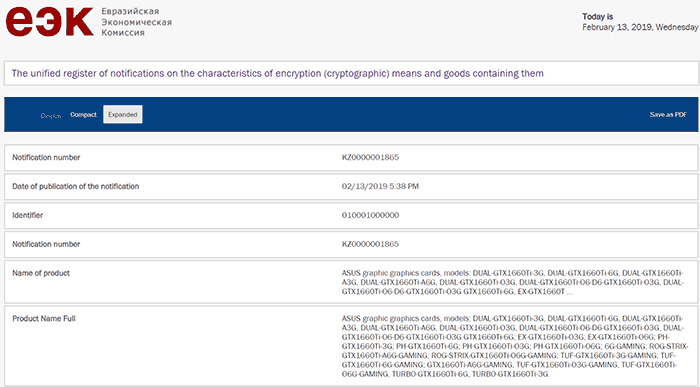 Late yesterday VideoCardz spotted a new crop of GTX 1660 Ti cards had appeared in the EEC database - from Asus this time around. 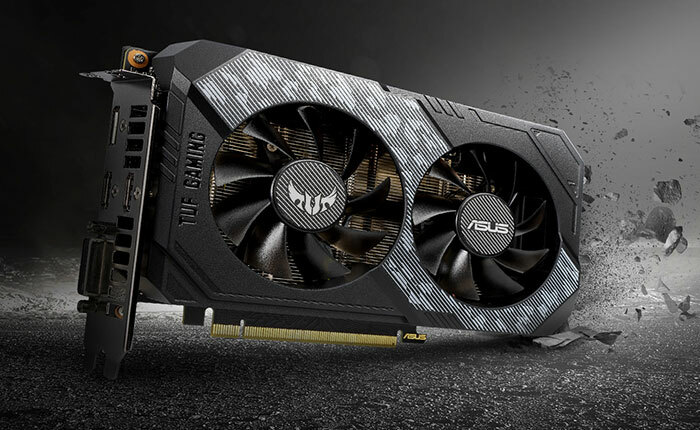 The Asus GTX 1660 Ti range looks to be the biggest yet, which isn't so surprising, but what has cause a raised eyebrow or two is that the manifest includes some 3GB variants for the first time. In brief, Asus will be releasing twenty Dual, Expedition, Phoenix, TUF, Turbo, and ROG Strix GeForce GTX 1660 Ti graphics cards, with almost half of them with 3GB versions, and about half accounted for by OC (factory overclocked) variants. The code names given in the EEC documents, such as DUAL-GTX1660Ti-3G, convert to more readable model names such as the Asus GTX 1660 Ti Dual with 3GB. VideoCardz has produced a handy reference table, similar to below. As you can see above, some models have up to six variants, a 'regular' version, an Advanced version with slightly higher clocks, and OC version which is overclocked, and then you have further permutations due to the 3GB or 6GB VRAM configurations. It is expected that we will see the Nvidia GeForce GTX 1660 Ti launched a little over a week from now, on 22nd Feb. Pricing should sit somewhere between the RTX 2060 and current GTX 1060. Elsewhere in this gap, at a later date, we should see the introduction of the GTX 1660 (non Ti version). 3Gb was questionable 2 years ago, now it's a real issue. No one should be buying cards with less than 4Gb vRAM. I will disagree, for those of us who play competitively. Textures are not that big of a deal, yea games can look nice but in action, it can be hard to notice unless you are lowering resolutions. I play overwatch at medium 1080p on a 660ti and get 120fps (shocking I know). But that consumes no more than 1.5gb of vram. I could go 1440p high no problem on my 970 and I have no doubt that the 1160ti will provide an adiquite experiance if it is for the masses of esports gamers and those who want to play at 1080p high. How can they keep getting away with this? “4K” cards with 8GB (or 11GB if you have more money than sense)and “mid range” cards with UP TO 6GB?? Like, the whole reason we need AMD to compete in the GPU space is to shame nvidia into not ripping us off. It's not working. But this isn't a low end card its a mid range card that will just be ham strung by lack of RAM. Might as well buy a second hand 970 or new 1050 and save a bucket of cash as there is only so fast you can go at 1080. Do you really need 500+ fps?